With a title like “Trouble Will Find Me” and two opening tracks called “I Should Live in Salt” and “Demons,” the National give the immediate impression that their sixth album will be more of the same introspective and self-demonizing alt-rock that has brought them this far. And in many ways, the album is a continuation. Singer Matt Berninger is 42 now, so this is no time to drop the cynicism and open up. The National have always relied on sad, relateable lyrics to drive their songs close to home. “Trouble Will Find Me” continues the gloom, but after all these years, Berninger has begun to expand his horizon a bit. Songs like “Sea of Love,” which might be my favorite song of the year so far, rallies about a situation filled with bad choices, a typical National song. What is not typical of the National, however, is some moments of dark humor and some namedrops across the record (Nirvana’s “Nevermind” album being one, to bring home the sadness). The National’s best albums, the two that preceded “Trouble,” relied on slight changes from the previous album, to make a separate but familiar listen. While the previous changes have been largely musical, “Trouble”s change relies more in lyric. Berninger seems to be making an attempt to bring himself closer to the listener, although the National have always been an engrossing band already. Still, Berninger sings about his own troubles, just ones that he relates to the listeners. 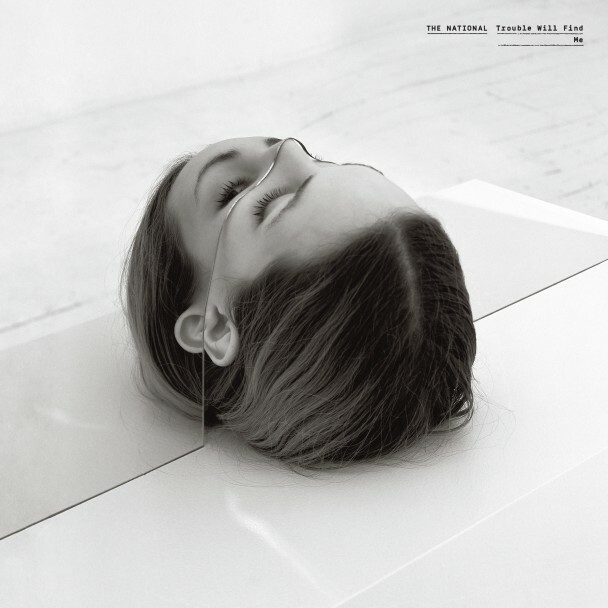 The album’s cover, an interesting one on it’s one, serves as a symbol for these troubles as Berninger is swallowed by his inner demons and can only look to himself for help. Somehow, he makes us all understand. The National have never been stupendous musically, and “Trouble” is no different, as the band focuses on the emotional impact of the lyrics. “Sea of Love”s pounding rhythm is one of their loudest songs, and is kind of a surprise on the album. But a majority of the songs are moderate-volume, guitar- or piano-driven tracks with repetitive music and lyrics, the band’s style. Sufjan Stevens, Richard Reed Parry and St. Vincent are among the album’s guest stars, with St. Vincent providing brief but powerful vocals on “Sea of Love.” The album may run a little long, and it feels a little anticlimactic after “Sea of Love”s boom, but the National have a way to always stay in the listener’s head. “Trouble Will Find Me” does this even more than their previous albums, and it might just be their best one yet.